Amistee has the ability to clean your commercial ventilation system through it’s expert staff and years of cleaning in the duct cleaning industry. When it comes to cleaning the ventilation system in your commercial building, you may want to think twice about hire just anyone. In Michigan, there are a limited number of duct cleaning firms equipped to properly evaluate and clean your HVAC system. Amistee has been cleaning Michigan commercial ductwork for years providing expert service to companies like Comerica Park, Meijer, Best Buy, Gibralter Trade Center, General Motors, Detroit Diesel, Michigan State Police and many more. Amistee is NADCA certified and also has a Commercial Ventilation Inspector on staff to provide you with the best level of service in the industry. With each commercial air duct cleaning your company will be provided a follow up report with any findings or suggestions from the air duct cleaning. 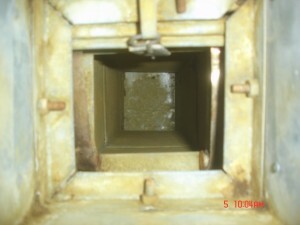 Call Amistee today at 877-349-8877 for an air duct evaluation in MI. When it comes to cleaning the HVAC system of your facility, it is important to know that not all duct cleaning companies are the same. Amistee Air Duct Cleaning has a high level of expertise in cleaning HVAC components and all of the ductwork attached to create a clean environment. A commercial air duct cleaning in Michigan may be made up of cleaning VAV boxes, reheat coils, cooling coils, HVAC components, flex ducting, and many other parts of a heating and cooling system. Amistee offers a service to its customers that will not disrupt the normal work environment of the facility while providing exceptional cleaning at a higher level. Amistee Air Duct Cleaning provides a written report to all of its commercial clients showing what work has been performed along with any recommendations that can be made to increase a buildings efficiency. Amistee is certified by the National Air Duct Cleaners Association and has a CVI (Commercial Ventilation Inspector) onsite to orchestrate an effective approach to cleaning a buildings heating and cooling air ducts. Call Amistee today to help your buildings occupants breathing and increase the buildings efficiency by maintaining the HVAC system at 248-349-8877 or submit an online request for an estimate. With a higher demand for qualified cleaning technicians in the country, Amistee Air Duct Cleanings commercial duct cleaning division has gone national on many occasions to satisfy its clients. Trips out of state to take on larger hospital duct cleaning projects and commercial building air duct cleaning has been long over due. 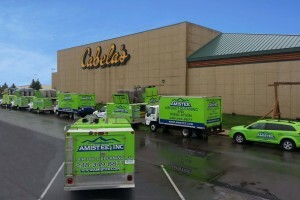 Amistee and its commercial air duct cleaning division in Michigan has been recognized as an industry leader for many years. The professional solutions it has given clients like The Henry Ford Health System, Comerica Park, Magna International and many more has made it to “go to” commercial duct cleaning contractor. If you have a facility in need of a comprehensive analysis contact Amistee by filling out a “contact us” form for a response by one of its commercial air duct cleaning representatives. 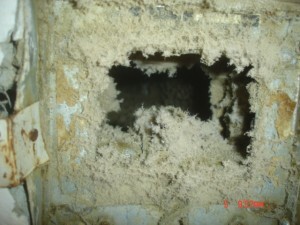 Many people wonder if their ductwork has mold inside of it. This is a tricky questions because there is not a “golden” answer. 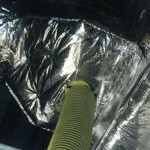 Ductwork is made out of metal which is non porous and mold can not “technically” grow on the metal itself. If a duct system is dirty and contains layers of contaminants then mold could potentially grow on the debris inside of the ductwork. 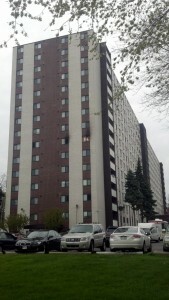 You can see from the picture below that there is a significant amount of debris for mold spores to adhere to. Proper cleaning of an air duct system and its vents can help reduce the amount of particulate coming out of the duct system and into your breathable living space. Amistee Air Duct Cleaning specializes in whole house air duct cleaning. If you are having a problem with indoor air quality or think you may have mildew or mold inside of your ductwork, get the cleaning done properly and do not waste your money with a company that could potentially make your problem worse. Check with your local BBB and make sure the potential company is a member of NADCA. 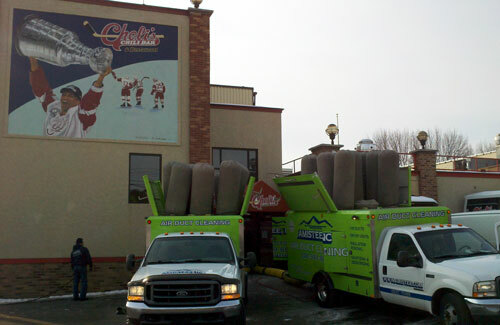 Commercial air duct cleaning contractors are not the same as residential air duct cleaners. 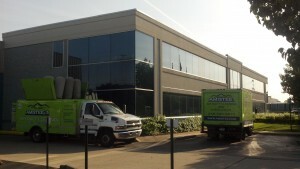 It takes a special type of company to be able to properly clean hospital, schools and government buildings. At Amistee Air Duct Cleaning we have a CVI (Commercial Ventilation Inspector) on staff and on every commercial job to make sure the cleanings are done right, the first time. 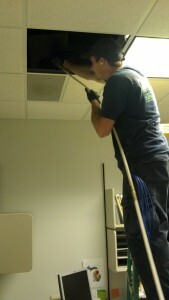 We specialize in large scale facilities air duct cleaning from start to finish. There is a reason why dozens of school districts air duct cleaning , hospitals air duct cleaning and other large facilities air duct cleaning is performed by Amistee. Call Amistee today to have your buildings system inspected to receive a diagnostic quote of what needs to be done to properly clean your system. 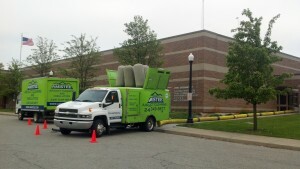 Amistee’s commercial service division will travel 1500 miles from its headquarters in Novi Michigan to service its commercial air duct cleaning clients.